Unicycle Boy is a brand new iOS game from the developer Spool. Spool also has two other apps out on the App Store, their 1st app was a simple music creation app called Beat Forge and their 2nd app was an arcade style game called Bird Jumper. 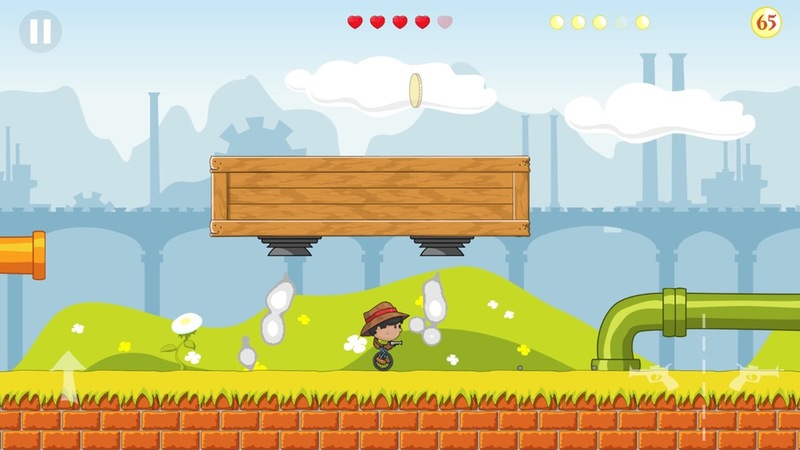 Unicycle Boy was born out of the desire of the developers to create an iOS game with a different control scheme. So many of the iOS games out on the App Store use conventional buttons on the touch screen for primary control. Unicycle Boy uses the accelerometer as the main input control method (moving the character to the left or right by tilting the iOS device). This is really clever considering the main character is riding a unicycle, where balance is absolutely required. Aside from translation controls you also have to jump the character over obstacles (you jump by swiping up on the left side of the screen) and shooting the pistol our unicycle riding hero is carrying (you shoot by tapping the shoot left or shoot right buttons on the right half of the screen). Unicycle boy was created by two brothers, one of them is an artist and both are musicians. Needless to say, they didn't need to contract out the art and the music for this app. Daniel New did all the artwork and graphic design and this was his first project creating artwork for a game. Michael New was was the developer behind coding the game and graphics engine for Unicycle Boy and both Michael and Daniel wrote the music. This is where things really get interesting. You can create and play your own stages! Nintendo is FINALLY releasing a verison of Super Mario Brothers for Wii U called Mario Maker which comes out later this year. Unlike Nintendo which took 30 years to release a version that allowes user created stages, Unicycle Boy lets you do this right now. One of my favorite computer games as a kid was a golf game for the PC that allowed you to build your own golf course and then play it. There is just something about being able to design and then play your own creations that is so much fun. If you create an account on the game you can share your custom stages with others and then play stages other people have designed. I really like this game. The best way I can think to describe the game is that is like Super Mario Brothers on a unicycle carrying a six shooter. But that hardly does it justice because it is very original and you can tell the developers really poured everything they had into the game. Games like this is what makes the iOS platform so amazing. Two talented brother can combine their talents and publish a game and they don't have to be major corporation like Nintendo. Give Unicycle Boy a try, it is truly a hidden gem.